There are infinitely many complex numbers $z$ such that $|z|= 1$. Can anybody just explain this to me so I can get the picture. Here $z=a+ib$ ie. $z=(a,b) $ and can be represented as a point or vector on complex plane above. $|z|^2=a^2+b^2 =1$. and this itself is a locus of a circle. which is the equation of a circle. Hence there are infinitely many points on this unit circle which satisfy the given equation. 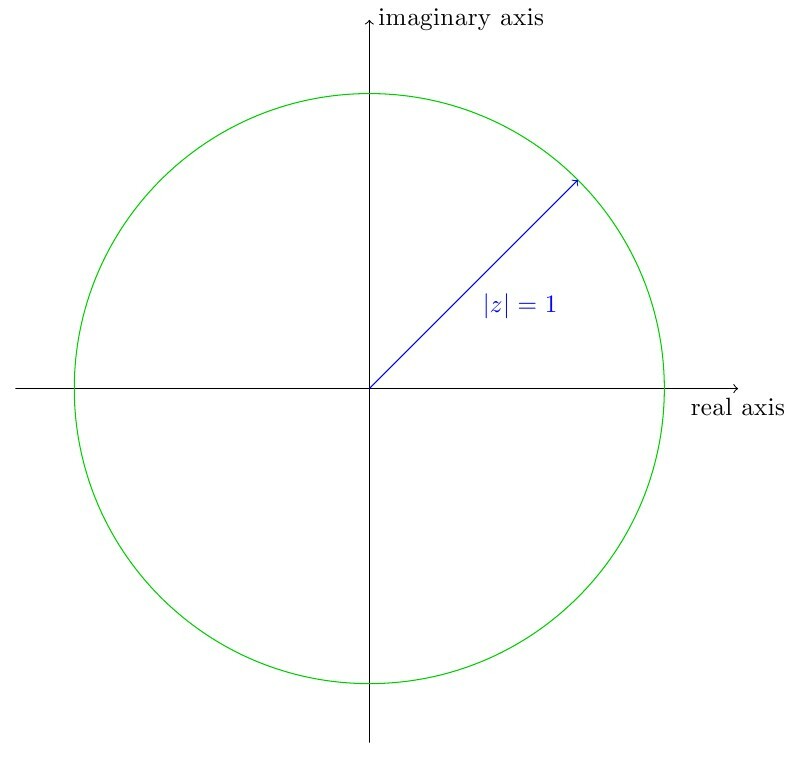 There are not only infinitely many complex numbers on the unit circle, there are infinitely many Gaussian numbers (both real and imaginary parts being rational) there. For, take a Gaussian integer $z=m+ni$, both $m$ and $n$ being ordinary integers, and calculate $z/\bar z$, something that you should have done many times in high school. You see that the resulting complex number $x+iy$ has both $x$ and $y$ in $\mathbb Q$, and of course its absolute value is $1$. Do complex numbers really exist? What are complex numbers, actually?